A triathlete practicing swimming in a lake in Chantaburi found a submerged car and called the authorities yesterday. A backhoe was brought in and the Honda City with Bangkok plates was dredged from 4 meters deep water 20 meters offshore at Nong Nam Khao lake. A large crowd watched as skeletal remains and other evidence was laid out on the ground. Bones were found both in the driver's seat and at other spots in the vehicle. The keys were still in the ignition that was "on" and the gear lever was in the D3 position. ID showed that the body was likely that of Reuangrit "Kob" Jitratho from Ban Phai, Khon Kaen who had been missing since November 2011. Searches were mounted back then after Reuangrit went to visit a girlfriend in the Chantaburi area but nothing was found. He was an engineer at the Double A paper company in Kabinburi. 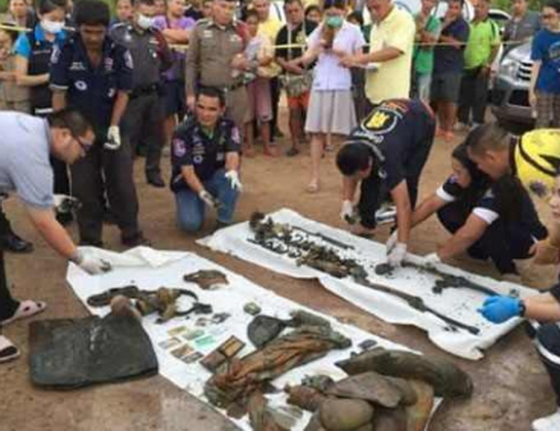 The car was found by triathlete Sirawat Phromkhli, 27, while out swimming in the lake. Police said there was no sign of foul play and they suspect suicide.
" A large crowd watched as skeletal remains and other evidence was laid out on the ground." " Police said there was no sign of foul play and they suspect suicide." It was submerged in four metres of water. I'm not a very good swimmer, but I can't imagine finding a car in that depth of water, unless you were diving, rather than just swimming?
" 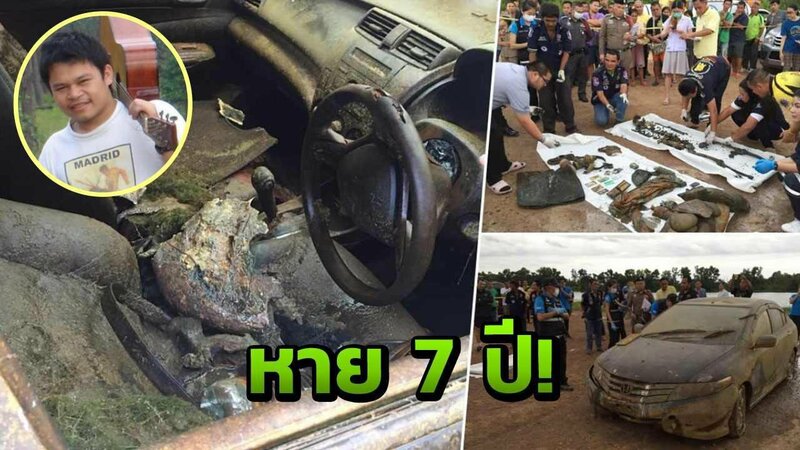 The car was found by triathlete S﻿irawat Phromkhli". Maybe he was wearing goggles and looking down into the water. 4 meters is only 12 feet. Unless the water is very murky that is not too much fresh water to look through, barring weeds and what not. still, crazy that they just posit the suicide notion. It could easily have been an accident, drinking, drove off the road, knocked himself out on the steering wheel drowned, could have been so many other things too. Relationship issues, jealous girl friend etc. Reminds me a bit of several stories in the USA, one in Florida in particular where a car full of teenagers went missing after leaving the high school prom. Something like 25 years later the car was found not too far off the road in one of the swamps. Investigators at the time had made some attempts to guess where the kids had gone and the route they had taken, but with so much water in Florida and things growing so fast, no obvious traces were found. Accidents do happen. A large crowd watched as skeletal remains and other evidence was laid out on the ground. Bones were found both in the driver's seat and at other spots in the vehicle...Police said there was no sign of foul play and they suspect suicide. ....would be nice to know, if the left door was open or closed. Jeez the cops are good here. Skeletal remains under water for going on 7 years and they immediately conclude it must be suicide. Brilliant minds at work. Thailand should really showcase the BIB by sending them around the world to solve all cold cases. BIB...."We think it was suicide".